This contemporary step stool looks as good as it works, and offers a versatile option in a lightweight five pound package. 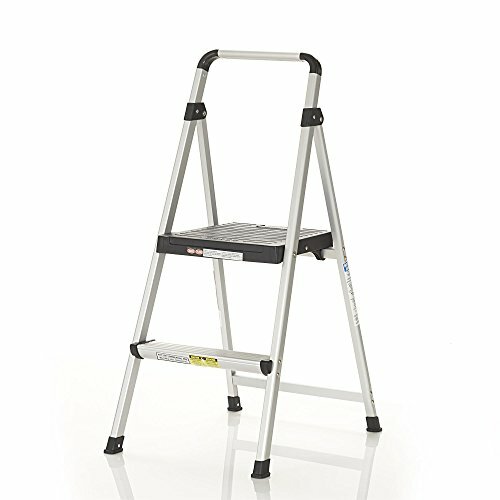 With its large, heavy-duty top step and ribbed, slip-resistant step treads, this step stool gives you added strength and durability you won't find in every stool For your convenience, this two step step stool features a self-locking fold and lock release and folds flat by lifting handle for easy transport and storage. If you have any questions about this product by Cosco, contact us by completing and submitting the form below. If you are looking for a specif part number, please include it with your message. AdjustaStep(tm) Deluxe Step Stool/Footstool with Handle/Handrail, Height Adjustable. 2 products in 1. Modern white/blue design. New for 2016.